The People for the Ethical Treatment of Animals (PETA) has always been controversial for employing colorful, extraordinary, if not shocking, campaigns to promote its animal rights advocacy. This time, they seem to outdo even themselves with their strange move in asking Maine officials for permission to build a large grave to mark the site of a truck crash that led to thousands of lobsters spilling out onto a highway. The group made the request on Wednesday. PETA also say they hope that such effort - if approved - will memorialize the “countless sensitive crustaceans” who were unfortunately killed during the crash in Brunswick that happened on August 22. Maine’s Department of Transportation spokesman Ted Talbot told the local media that they are reviewing said PETA request. He also shared that temporary signs are allowed but they can be no larger than 4 feet by 8 feet. They can also be only in public for up to a maximum of 12 weeks. 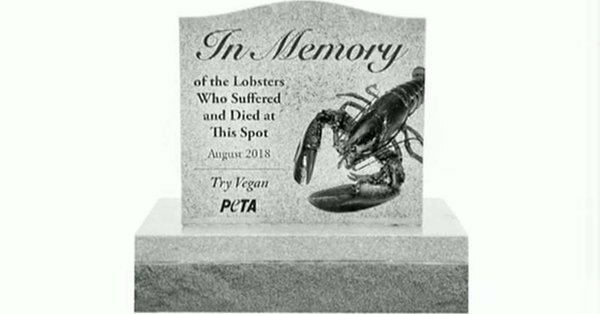 PETA is eyeing to erect a 5-foot memorial for the lobsters. They hope to place it on Route 1 in Brunswick. Police estimate that around 7,000 pounds of live lobsters were destroyed in the crash. It is also suspected that more than 4,500 lobsters died during that fateful day of the accident. PETA did not give figures yet on how much the gravestone is likely to cost if it is approved. The organization has previously defended its use of “notorious” tactics in their campaigns by arguing that they must rely largely on free “advertising” and that could only be possible through media coverage. PETA also whined that based on their experience, the media does not consider the terrible facts about animal suffering alone as interesting enough to cover. As such, the group says, they were compelled to “shake people up” so they can initiate discussion, debate, questioning of the status quo, and, of course, action. PETA’s new seemingly “outrageous” proposal has people reacting on social media - many of them unfavorable to the group, however. How about PETA doing something sbout muslims slaughtering animals? It's fine if they pay for it. OMG!!! These crustaceans were headed to restaurants to be cooked anyway! It would be nice to see some group stand up for the innocent victims of the muslim slaughter going on in predominately white countries. What do y'all except from a bunch of NUT CASES.